Carnation Lady Spring (Dianthus caryophyllus) bears fresh green double flowers over a long period of time. A traditional favourite as cut flowers, Carnations produce long lasting clove scented flowers on tall stems. Very easy to grow, these tough perennials produce masses of flowers above silvery grey foliage. 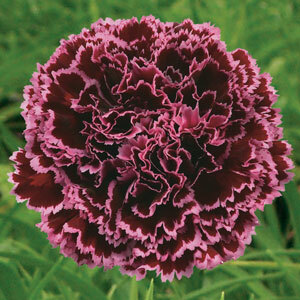 Ideal for pots and edging, Carnations will flower continuously throughout the season. Attractive narrow grey-green foliage. Prefers a full sun position in well drained soil. Removing spent flowers will encourage more buds to form. Will attract butterflies to your garden.